Here you will find written directions for the four main directions as well as Mendip Crematorium and Shepton Mallet Treatment Centre. You will be on the A37 and as soon as you pass the Downside Inn which will be on your right and turn right onto the B3136 marked Shepton Mallet town centre. Go down the hill, under the old railway viaduct until you reach the bottom of the hill and then follow the road round to the right. Take the first left into Great Ostry (If you reach a mini roundabout you have overshot Great Ostry by 100 yards!) and go up the short slope then immediately follow round to the left until you enter the small public car park from where you will see the signs for The Swan. Following the A361 pass through the traffic lights at Charlton Inn crossroads and continue through the town. When you reach the mini roundabout turn right into Rectory Road and continue for 100 yards then turn right into Great Ostry. Go up the short slope then immediately follow round to the left until you enter the small public car park from where you will see the signs for The Swan. Follow the A37 to Shepton Mallet and at the first roundabout follow the road to the left to continue on the A37. After 400 yards there is another roundabout and you should continue straight over following the A37 until the first set of traffic lights (Charlton Inn crossroads) where you should turn left towards the town centre until you reach a mini roundabout. Then turn right into Rectory Road and continue for 100 yards then turn right into Great Ostry and then immediately follow round to the left until you enter the small public car park from where you will see the signs for The Swan. 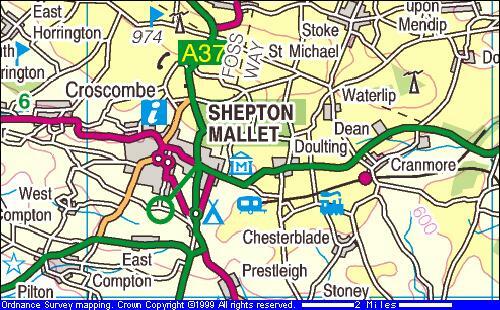 Follow the A371 from Wells until you reach the first mini roundabout in Shepton Mallet. Turn left into Rectory Road and continue for 100 yards then turn right into Great Ostry. Go up the short slope then immediately follow round to the left until you enter the small public car park from where you will see the signs for The Swan. Turn right out of the Crematorium and head east along Old Wells Road. After about 3/4 mile you will come to the A3136 (at this point called West Shepton). Turn left and go along the B3136 for about 400 yards going straight ahead at the two mini roundabouts until you reach a conventional roundabout. Turn left at the conventional roundabout and go along Old Market Road for just over 100 yards then at another mini roundabout go straight ahead into Rectory Road. Continue ahead for 100 yards then turn right into Great Ostry. Go up the short slope then immediately follow round to the left until you enter the small public car park from where you will see the signs for The Swan. From the Treatment Centre turn right into St Peter's Road and reach Old Wells Road. Turn left and after a few hundred yards you will come to the A3136 (at this point called West Shepton). Turn left and go along the B3136 for about 400 yards going straight ahead at the two mini roundabouts until you reach a conventional roundabout. Turn left at the conventional roundabout and go along Old Market Road for just over 100 yards then at another mini roundabout go straight ahead into Rectory Road. Continue ahead for 100 yards then turn right into Great Ostry. When you reach the mini roundabout turn right into Rectory Road and continue for 100 yards then turn right into Great Ostry. Go up the short slope then immediately follow round to the left until you enter the small public car park from where you will see the signs for The Swan.